B U B B L E G A R M: My Favourite Hair Product! I love styling my hair and experimenting with different looks. However, I don't like the damage that comes with it. Dry/split ends look disgusting and give me the creeps. Regular trims are the answer to all hair problems, but when your trying to grow your hair, it doesn't seem so smart. I have recently started using my all time favourite hair product again which I used to use for YEARS and my hair is looking much better! My mum recently gave me a bottle and I am rediscovering my love for it all over again. 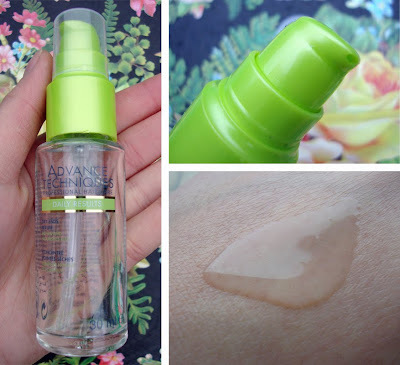 It's Avon's advance techniques daily results dry end serum. I use 2-3 pumps of this serum on towel dried hair which detangles and makes my hair feel so much smoother and easier to manage. If my conditioner is not very good (Lush American Cream for example) this helps drastically! If necessary I use 1 pump on the ends of my hair after blowdrying or styling to seal in my cuticles. I hate buying 2 different serums for wet and dry hair. This product can be used either way! Usually I would go the natural route, which I had been doing with olive oil and using it as a serum, but it gets so greasy and smelly to use everyday and is better suited as a deep conditioning treatment. This has a non offensive pleasant scent and also contains sunscreen for protection. I have also tried plenty of other serums that don't do a better job but cost 10X the price! The best part.... Wait for it, is the price! It's normally £4.80 but I have just checked Avon's website and it's been reduced to £1.95. However, my mum gets ours from the market at 3 for £5. Bargain! I really like the photos you took of this bottle--and the fact that it's a glass bottle at that. Sounds like something I could use, as my ends easily go dry. Awesome find/re-discovery! I may just have to check that out, for the price--it would be hard to go wrong! Ah I love it when I see product reviews on things that I love and use daily. No other serums work as well as this at keeping my ends from splitting. Here in Canada we have a great serum called Marc Antony Smooth, I love it cause all his products are alcohol free. I find alcohol very drying, personally. I too, like to use a hair oil but find them too greasy or smelly to use at any time aside from before showering. My mother-in-law suggested to me that I try Jasmine Oil, it's light and smells nice. love the fact that it doesnt get greasy/oily all over your hands, and it's pretty effective! @aaina jasmine oil is i will check out in the future, thanks! Oooh, I definitely want to check this out. I use Biosilk and I love it.. just not the greasy feeling it leaves in your hands. Avon has some really good products that people tend to overlook. Wow, right I need this! Thank you for posting :). I haven't really tried Avon before. Great review. im gonna check this out. btw, i followed you. you might wanna check me out too. :) hugs! hey,i just discovered your blog when i was looking for lipsticks :D and it's awesome to have same fav hair product.it's so effective according to it's cost. I love styling your hair and experimenting with different looks. However, you don't like the damage that comes with it. Dry/split ends look disgusting and give you the creeps.